I gifted myself some time off from teaching mindfulness this summer. It was a summer to learn, grow and smile. 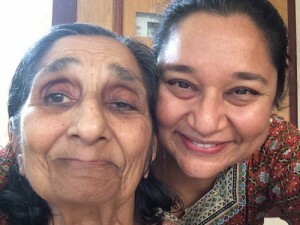 I spent a few weeks with my parents in India. Perhaps you know that my mother lives with advanced Alzheimer’s at home, with my father as her primary caregiver. I try to go and spend 3-4 weeks with them, two to three times a year. While it is always a touching and heartbreaking time, it also is a time for much growth and healing for all of us. While I was there, I saw both my parents improve dramatically in physical and emotional health. I could see the power of mindfulness and compassion first hand as the transformation touched us all. It is hard to believe that simply offering undivided kind attention and softening the heart can allow for a such a deep connection. These practices offered physical and emotional healing, an opening to joy even in the midst of challenge and loss, and so much stress resilience. My mother was able to start walking again with assistance after being in a wheelchair for months. She was able to come out of her glazed foggy look to connect with me, remember me and offer kindness and care back. It was touching to see her eyes light up and her hand hold mine with softness and her heart remembering and recognizing what her mind had forgotten. It was nothing short of a miracle! And I could be present for the range of emotions without drowning in sorrow, grief, anger and pity as I have in past years. I could hold all of it with balance and care. My father also felt the support and care and started to engage with life and those around him with renewed energy and joy. There was so much wisdom, compassion and insight I gleaned from this time with my parents. I am feeling the perfectness of life, and I also see how much room there is for improvement, growth and care. And so I continue to sit with kind, curious attention to see what will unfold next in this adventure of our lives. I hope you too, my dear friend, will be able to gift yourself a few moments of quiet – a few minutes, and perhaps even a half day or a full day of being unplugged from daily life. You may be surprised at how rich the experience of “doing nothing” can be! May you continue to incline towards greater wisdom and care in your life. This entry was posted in Kindness, Mindfulness. Bookmark the permalink.